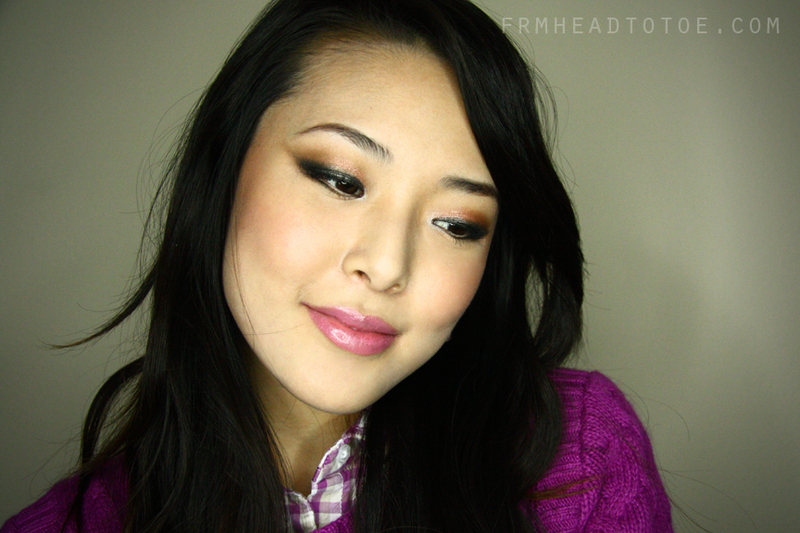 I feel like it's been quite a while since I last posted up a strictly monolid tutorial! I've had a lot of requests for looks that don't involve any type of false lashes. I know falsies can be intimidating and over-the-top for most people to wear on a daily basis, so I wanted to show you guys what I've been wearing lately on days when I want to look a little more dressier but still working with my creaseless eyes. I don't remember where I got the necklace & earrings from! For those of you who are new to the term "monolid" it refers to the lack of an upper eyelid crease which is common among (but not exclusive to) Asians. As you can see here, there is no distinct crease on my eyelid. To enhance the flat surface, I layered my eyeshadow to create depth and interest, accentuating the almond shape of my eyes. When I recorded this tutorial, I actually had uneven eyelids, the left eye being a true monolid and my right eye had a very small crease which in Korean we call "sok ssangapul" which literally translates to "inner/hidden eyelid crease" which you can see below. Layering the steps of waterproof eyeliner (gel liner, then waterproof pencil to smudge, then set with eyeshadow) will help the eyes to stay strong all day and not smudge around giving you panda eyes. And you know me, I always have to take some sillies with each photoshoot. Kiss, kiss! I hope you guys enjoyed this tutorial and let me know in the comments what you would like to see next. I'm thinking I want to focus on doing more "basics" tutorials like how to apply gel/liquid/pencil eyeliner, how to apply foundation, how to apply bb cream, etc but I'd love your feedback on what is most important on your list! Does waterproof makeup come off without scrubbing, just some eye makeup remover on a towelette? I've avoided buying waterproof for that reason--I want removal to be as easy as possible, because I'm usually dead tired and too lazy to do more than swipe a few times with remover and splash some water on my face. thanks for the post! i happen to have asian eyes with a crease, but i still appreciate the monolid tutorials. i would love to see basic tutorials on applying eyeliner (gel & pencil), false eyelashes & maybe a post on what are the best make-up brushes to do what (does that make sense)? You make this look so easy, your very talented at makeup! Every time I've tried to get fancy with eyeliner and smoking, I do a terrible job :/! I like this tut a lot! I have eyelids that aren't quite monolids but aren't quite creased either PLUS they're not even and it is SO HARD to get eyeshadow to match on both sides. I usually end up doing something similar to this. I think basic tuts would be a great idea! Yay! Thank you for doing this look :D Would love to see more "basic" tutorials. I still consider myself a makeup newbie and such tutorials would be really helpful to those who are new to makeup. Love your videos! It's great to see another Korean makeup guru. I have been trying to get a hold of the baby lips in pink punch ever since you mentioned it a few videos back. I live in Australia and they do not stock it here and I'm even finding it hard on eBay (as I want 2). Do you have any recommendations on how I can get my hands on some? I will pay anyone!! And to make matters worse they are only a couple of dollars! Its like they don't want us Australians to have the good stuff.. No naked palette, Nara blush palette either :(. Please help! I think a tutorial on eyeliner basics would be great! I love your tutorials. Beautiful! I would love to see a bb cream tutorial. Some basic tutorials would be good for those who are new to makeup application (especially a liner tut.). Eyeshadow is my favorite product, so different application techniques and effects are where I need some help. I really like this look! Thank you for the tutorial! I'll have to try your advice on waterproofing liner - I always just use liquid liner only but by midday it usually smudges and leaves a half ring on my eyelid. Great tutorial! And thx for inspiring me to layer and use more accessories! Love all of your tutorials and hits and misses too :) Btw just started using Smashbox BB cream. Looks promising so far. Maybe you can review/compare it to other BB creams you have some time? Your makeup is PERFECTION! Your eye makeup is stunning! Pls show us the "How To". Basics are good. thanks. I would love to see a liquid foundation tutorial! I've applied it so many times before, but I want to know how to get that professional look. Thank you for posting exclusive monolid tutorials - there isn't another Guru out there that truly has monolids so watching your videos is great! I think basic tutorials are an awesome idea, it would help so many monolidders, like myself! This look is perfect for me! Thanks!! Hey Jen! Although I do not have a monolid, I love the colors you chose! You always make me excited to play with what I already have in my makeup drawer! I would love a tutorial on how to apply BB cream. Love all your videos. I used to watch Michelle Phan but hers I think is too heavy. Too many layers personally for me. I prefer simple still gets GREAT result. Thanks! Thanks for all your videos&pictures: really helpful for a fellow mono-lidder! I've looked through your hair tutorials and was wondering, how are you currently styling your hair? It's got beautiful natural curls but it's neither the wave/many curls look you showed before...are you using curlers or straighteners? I'd love to re-create your look! My hair is not as long as yours but it seriously lacks volume, especially at the roots! Thank you for this tutorial. I like the color and will try this. I have a question. I also have monolid. I usually use eye primer (urban decay now). But, in the afternoon, my eye make up just smudge (my water proof japanese eyeliner, my scandal queen mascara). I look like panda. How to prevent the smudges? thank you so much Jen. Please do more basic tutorials! Especially if they focus on monolids. I would love to see a tutorial on how to best wear eyelid tape discreetly! Thanks so much Jen. I'd have to say what I'd like help with the most is creating lovely dewy, healthy looking skin with makeup. u should do more naked tutorial! I have naked 1 and I wanna use all of the shades. i haven't even touched gunmetal..
i always enjoy your tutorials and this is no exception. i was hoping you could create more natural looks such as for when you are going to meet the bf's parents for the first time or an interview or attending a wedding - something a little more plain, just accentuating your features where people can't tell as much that you're wearing make up. thanks! CL: The day I recorded this video, I didn't actually style it. XD My hair was extra curly after sleeping on wet hair the night before. I think my hair got twisted and stayed in curls! It was a lucky hair day. Haha. I love your tutorials and reviews! I would also love a review on various mascaras or methods by which Asian girls with long but REALLY straight lashes can keep the curl after using an eyelash curler. I've tried waterproof mascaras by themselves (incl Shiseido Lifting Mascara) and non-waterproof mascaras used with the Shiseido mascara base. Both seem to do a decent job of maintaining the curl, but I'm still looking for clump-free, thick, dark, curled lashes. Any ideas? what a lovely look <3 you're gorgeous, as always. This look is gorgeous on you! Please do more without falsies!! I love your tutorials as they are practical for me! I'm a monolid asian. 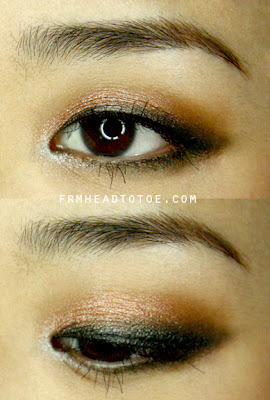 I wish you can create more monolid eyeshadow combinations and tricks especially for work use. Thanks! love this post! can you also do a job interview look for monolids? please! love your tutorials! your instructions and demonstrations are easy to understand and see. Yes! Please do a tutorial On applying foundation primer and using blush vs bronzer and how to apply. That would be so helpful in my everyday makeup routine! Thx! Thank you for sharing this great tutorial. I agree with the other readers, if you could do a review on different brand of BB that would be great. You're beautiful! And I love the tutorial. Thank you for showing me that it is possible to wear eyeshadow on Asian eyes! I used to try and looked awful and glittery. Although now I feel the need to go out and buy the Naked Palette and some gel eyeliner (I always manage to ruin/poke myself in the eye with liquid). Super cute! Love the makeup! I love your new video! watching is so nice, you are such a sweet person! i like that the look is very neutral and soft! i dont have monolids, but I think I will recreate at least the colours. also i have been searching all over for the lipbutter of revlon, we dont have it here in europe unfortunately. do you know a dupe which can be broight in europe? I'm going to have to vote for a basic BB cream tutorial. Mainly because I rarely use anything on my face, but have these red spots I'd like to conceal. And just overall even out my skin tone and heard BB creams work wonders. Tips on keeping your face from peeling due to dry skin in the winter? Are there tricks besides an amazing moisturizer? What effect does using liquid vs. powder foundation have on dry skin? Love this! Very helpful. I would like to know more about bb cream and I like more of the natural look so maybe you could do tutorials for very simple everyday looks. looks greats!! really appreciate monolid tutorials! will definitely try it out. Hey Jen!would really love if you do a "basic" tutorial of applying eyeliner(especially gel type) for monolids. Because im a monolid as well, and its hard to estimate the height and draw the line when theres already no crease as a guide. Plus you do it really beautifully! Love this! What color eyebrow pen would you recommend for someone with black hair/brows? Hi Jen, it's my first time writing but 2nd or 3rd time watching this video and I think it's this video that helped me discover you on youtube. No one ever taught me anything about makeup and it was a struggle to figure out how to disregard all the traditional techniques for white people that just didn't work for me. 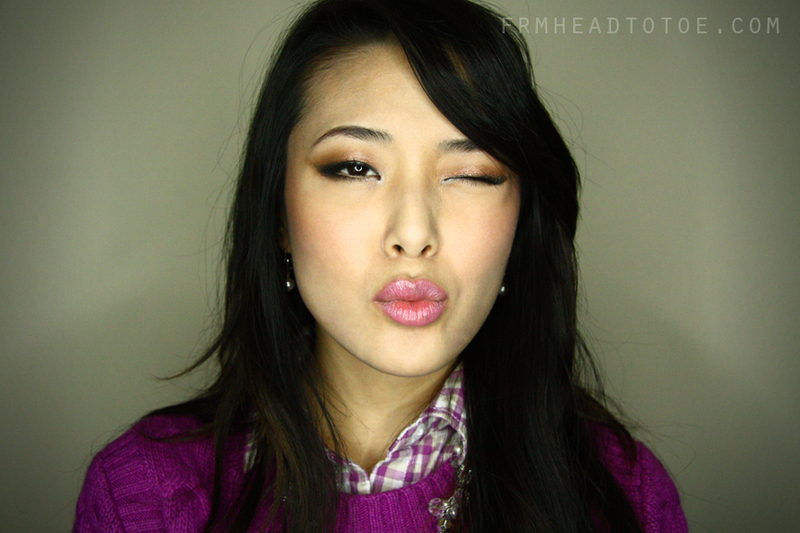 This look and all the looks for which you provide tutorials are beautiful and flattering. It's empowering! I wish something like your videos had been available to me and others twenty years ago when I was a teenager. Even now I refuse to let any non-Asian makeup artist (unless it's a male -- just because men seem to spend a lot more time practicing on lots of different types of people) try to put makeup on me because they just don't have a clue. I think you should write a book where you put a lot of these basics together so people can use it as a reference, including non-Asian makeup artists! love yours tutorial.. so cool..